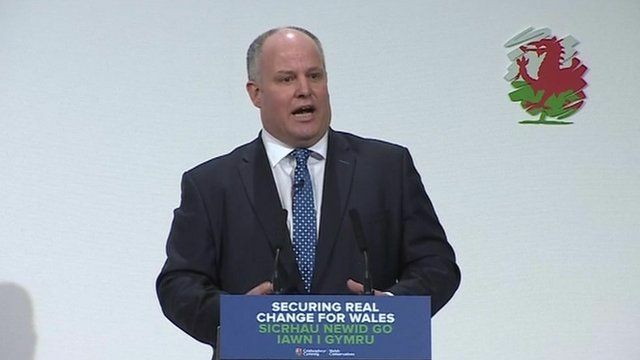 'Lazy Labour has run out of steam' Jump to media player Welsh Conservative leader Andrew RT Davies tells his party conference it is time for a change after 17 years of Welsh Labour in power. 'Blue when I was born and I'm blue now' Jump to media player Welsh Tory leader Andrew RT Davies was born on the family farm, but now has his eye on winning the assembly election. Chancellor slams 'old' Labour Jump to media player The assembly election is a choice between "pro-job, pro-growth" Conservatives and "old and discredited" Labour ideas, the chancellor says. Ministers' pay cut to fund youth schemes Jump to media player The Conservatives will introduce a 10% pay cut for Welsh government ministers if they win May's assembly election. Welsh Conservative leader Andrew RT Davies has said it is time to secure "real change" after 17 years of Welsh Labour in power. He told his party conference in Llangollen, Denbighshire, that a "lazy, complacent" Welsh Labour government had "run out of steam". Mr Davies claimed other parties would simply prop them up for a "sniff of power".